Around this time last year, I remember being shocked at how I was expected to pass two months living out of a carry-on sized suitcase. There are, however, several reasons for packing light as a primatologist (or any tropical field biologist). First, fewer items amount to fewer things to keep track of. Second, everything we bring we can reasonably assume will return either dirty or damaged (no nice clothing or expensive electronics). Third, poor personal hygiene is perfectly acceptable (you deserve to be laughed at if you bring deodorant). All this, of course, is a little disingenuous as I am traveling to one of the cushiest, most luxurious field stations that you can ever realistically expect to visit in the middle of the rainforest. The excellent station staff (the Tigres) prepare all of our meals and do all of our laundry, even changing our sheets and towels twice a week. I therefore need only to plan for four days or so of clothing. All this makes me wonder whether I’ll ever be ready for real fieldwork . 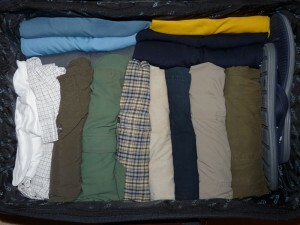 . .
That being said, here are my steps for packing like a primatologist. 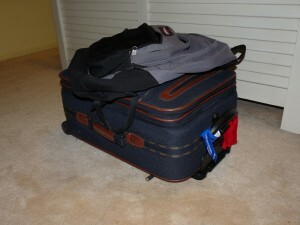 Step 1: Line the bottom of the suitcase with clothes. If you don’t already know, rolling up clothing is the most effective way to pack efficiently (it’s true, see NYTimes article). Here I have four sets of shirts, four sets of pants, and seven or so t-shirts. I alternated between only two sets of pants/shirts last year, which turned out quite unpleasant after a while–there is just no way to dry out a wet, sticky, moldy shirt in one of the most humid areas of the world (and no way to enjoy putting it on day after day). I also stuck in a pair of flip-flops (the primary means of transport around camp). Step 2: Add an assortment of field equipment. 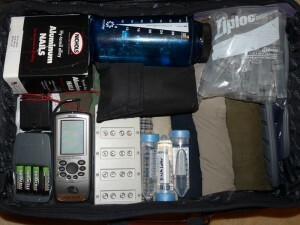 Here I have a box of nails (which I’m carrying for my undergrad advisor), a GPS (also his), a new radio receiver (also his), a compass, batteries and chargers, falcon tubes filled with RNA later, poop tubes, and a water bottle stuffed with goodies (my razor, swiss army knife, Leatherman, a nail clipper, etc.). Step 3: Repeat with a new layer of stuff. Here I have my binoculars (an unusually large pair), more batteries, toiletries, insoles, an umbrella (raincoats can be smelly), a bandana, and pajamas (nearly forgot them). The top pocket I stuffed with boxers and socks. I developed somewhat of an obsession the past few years with Smartwool brand socks, which manage to stay dry and comfortable even in the middle of the rainforest. There are four pairs packed away up there, along with two pairs of Wigwam socks, which I will scientifically test to see if they measure up to Smartwool. This curiosity arose after a conversation last year with Luca, a grad student at NYU, who made me feel so ashamed after buying a pair of Wigwams that I returned them to the store the next day. Screw you Luca. 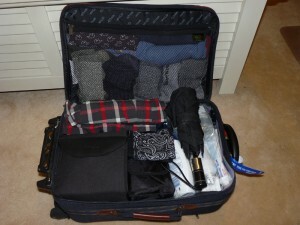 Step 4: Finally, close the suitcase! Mine did so with plenty of room to spare. Along with the backpack on top (for my laptop, camera, and a book), and a set of casual clothes that I will wear tomorrow, that concludes my packing for the night. I have yet to pick a book to bring. Last year, I unwisely forgot to bring one (excluding a GRE book that I never opened) and instead bought The Story of Sushi in Quito at a rather expensive price, then had to endure two months of reading and learning all there is to know about a food that I couldn’t eat. For at least the next two weeks, I will be tracking woolly monkeys, checking to make sure the radio collars on some of them are functioning, and collecting lots and lots of poop. Poop, by the way, is immensely valuable for primatologists, who use it for anything from DNA to hormone to diet analysis. Imagine itching to collect a sample from an animal high in the canopy, preferably without affecting its behavior. It is a pretty helpless feeling, but luckily, animals occasionally grant us that perfect sample, directly onto the rainforest floor! It really is quite fortunate that animals do it. Finding poop is an art that took me two months to perfect last year–I’m hoping now that I haven’t lost my eye, ear, and nose for it. 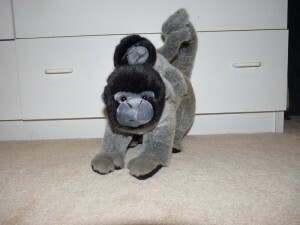 Before I sign off and go to bed, here is what woolly monkeys look like (from my home in New Jersey, this is the best I could do). Next post will be from Ecuador and may even have pictures of real woollies! ps: i am super impressed with your packing and will be following your instructions closely (though slightly modified to work for a large backpack instead of a suitcase) in a couple weeks. have fun down there dude. Kenny! You have a blog! I was just perusing the internet for primatologists who happen to like blogging and look at what I found. This does look like a very helpful guide. I will have to remember it next time I pack and travel for the field. Keep up the monkey business and being a poo processor (that is my current title) I have leave you with this blessing: may the monkey poo be with you. PS Yeah, sushi is great, don’t diss the sushi! Alie: I definitely eat sushi and I love it (though I will no longer eat Atlantic bluefin tuna). It was difficult reading about it at the time because I had no way of accessing it in the rainforest. Best wishes for your fieldwork in Indonesia! Laura: Thanks for your comments and best wishes for your fieldwork! May the poop be plentiful down in Mexico! Hello! 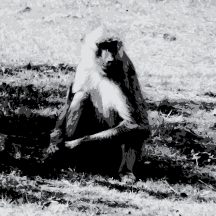 I’m a college student considering field biology, even primatology. If you have anything to say (good or bad) about your line of work, I would love to hear it… like what your day to day is, how often you are in the field, and what you do when there. Anything would be appreciated!